On Wednesday, I left a phone message for Lawrence, alerting her that back in Nov. she'd posted fake news with the headline, "WHOA! Hillary Caught On Hot Mic Trashing Beyonce' with RACIAL SLURS! Looks like Hillary may have just lost one of her biggest endorsements." The fakeness of the Lawrence's post was never in doubt from the moment she posted it. DISCLAIMER: The Resistance may include information from sources that may or may not be reliable and facts that don't necessarily exist. All articles should be considered satirical and any and all quotes attributed to actual people complete and total baloney. 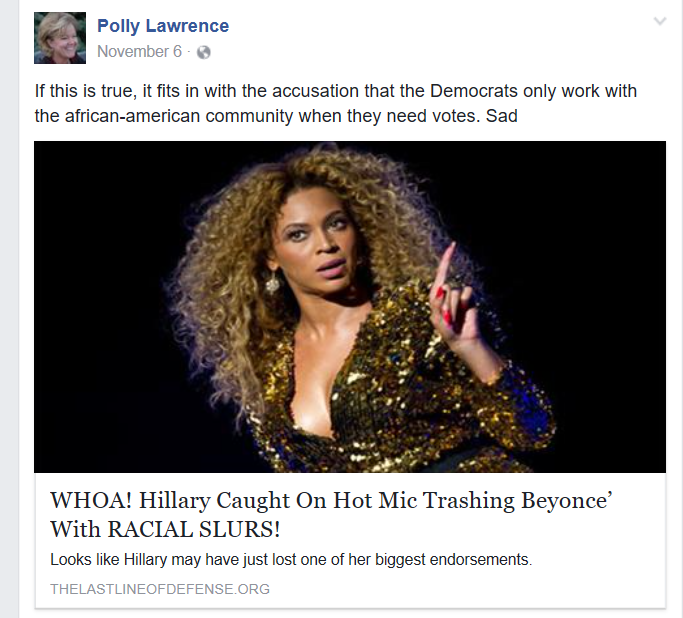 What's more, Snopes determined on Nov. 5, the day before Lawrence posted the item, that the Beyonce' item was false. Still, Lawrence posted the fake news with the comment, "If this is true, it fits in with the accusation that the Democrats only work with the African-American community when they need votes." But you know what's great? Lawrence accepted criticism and removed the fake news. At least I think that's why Lawrence removed it. She didn't return my call, which is too bad because I would have heaped even more praise on her. In my phone message, in which I thanked Lawrence for removing the fake news, I asked her if she'd sign the Fake News Pledge, which is a promise 1) not to post fake news, defined as false information "packaged to look like news," and 2) to post a correction and explanation on Facebook if fake news is accidentally posted. The Pledge's arbiters of fake news are Snopes, Politifact, Factcheck.org, or a respected news outlet. If Pledge signers disagree with the specified arbiters, they do not have to remove anything from Facebook. But they are obliged to explain why they disagree with the fact checkers. Lawrence did not respond to my request that she sign the Fake News Pledge, and she still has at least one fake-news meme on her site, with a misquote of Obama, which I'll ask her about later. The three other lawmakers cited in the BigMedia.org investigation have refused to delete fake news. Rep. Gordon Klingenschmitt (R-Colorado Springs) refused to believe that Scalia was not, without a doubt, assassinated by the Clintons. And State Sen. Tim Neville (R-Littleton) refused to remove two items deemed false by fact checkers from his Facebook page. State Sen. Laura Woods (R-Arvada), who's left office as well, did not respond to my requests that she remove fake news from her Facebook page.